At Webb, students and faculty from across the country and around the world live, learn, and thrive together both in and out of the classroom. Consider this your invitation. Discover Webb! Taylor Stockdale invites you to read his most recent letters, meet the Board of Trustees, and learn about Webb's Centennial Strategic Plan. At Webb we focus on giving students a broad-based liberal arts and sciences education where learning happens through authentic discovery and rigorous scholarship. 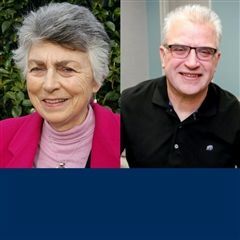 We work to prepare students, not just for entry into the most selective colleges and universities, but also for the rigors of leading in a fast-paced, fluid global community where personal integrity and moral courage are paramount. Webb athletics, built on our core value of honor, promotes character, self-confidence, and a sense of commitment that inspires student athletes to become leaders throughout their lives. We field 42 teams in 15 different sports. Webb teams own 80 league titles and 3 CIF titles. Art is about seeing different perspectives, effectively communicating ideas, and finding inventive solutions to problems—all essential skills for future leadership. At Webb, art is not extra: every student takes at least two years of art courses, and student art is part of almost every aspect of campus life. The Alf Museum is a perfect example of unbounded thinking in action. It’s not just a place where students go to look at fossils. It’s a place where students are part of the scientific process, where they learn the joy of discovery, where they actually advance science. Thank you for taking a few moments to learn about supporting The Webb Schools and how your support makes Webb’s mission possible. Webb is a very special place. Its academic mission, nearly 100 years old, is more relevant and exciting today than ever before. Come experience the wonders of boarding school life this summer at Webb. We offer an amazing opportunity for students advancing into grades 7, 8, and 9. Our Junior Scholars Program is one-of-a-kind with special concentrations in paleontology, leadership, digital arts, and science and engineering. I wanted to write you and reflect a bit on this important day, and also share some thoughts on the times in which we live. As I looked out to the flag pole this morning and saw the flag at half-staff, I was reminded of that unforgettable morning 16 years ago. I know we can all relate and that we have our own vivid memories of how we managed and coped with the surreal and horrific events that were taking place in New York, Washington, and in the skies over Pennsylvania. As I reflect on September 11th, I'm also drawn to today's world and all that our students and we are experiencing. I’m sure I won’t confuse anyone when I say these are “trying times.” Whether I’m referring to the devastation suffered by the people of Texas as a result of Hurricane Harvey and its aftermath, or the aftermath of Irma, or the unease and anxiety over the international chaos and heightened state of affairs related to North Korea, or the uncharted and volatile political environment in Washington and beyond, when I say “trying times” all heads seem to nod. I don’t want to talk politics right now. But I do want to talk about our students and their families and how we might help them. Of course, as a school community, we are in the business of education. It’s our job, and here at Webb we’re at it 24/7. I know that all over campus, in small groups and large ones, the problems and issues of our day are being talked about. I know it is happening casually and formally inside the classroom and out. I want to thank you for it and ask you to keep it up. Speaking personally, I remember being in boarding school when the Soviets invaded Afghanistan (I’m dating myself a bit, but that was in 1979.) I remember being terrified, as all students were pre-registered for a potential draft during that spring. But I also remember keeping up a pretty hard shell, and not showing my anxiety. Of course, after the fact, as alumni, we all talked about how we were feeling the same level of anxiety and yet never wanted to open up about it. Not to put too fine of a point on this, but the reality is teenagers are good at covering things up when they feel a high degree of nervous energy. The more we can engage as adults, the healthier we will be. This is when “community” counts most. Our community and its daily structure, its regularity, can be comforting and supportive as well. The way our days move from shared meals, to shared mid-morning meetings and chapel, team sports, afternoon activities, dorm activities, and on and on…supports and nurtures our students and works to temper the stress of our modern world. I don’t believe it should block it out or that any of us should pretend that these issues aren’t real. Indeed, they are. But I do think that if we look to our mission and our community of teachers, staff and students that work to live it every day—there’s not another place I’d rather be right now, or another vocation in which I’d rather be engaged. Wilson Parnell '13 was a featured speaker at the TEDx University of Redlands event on March 23, 2019. 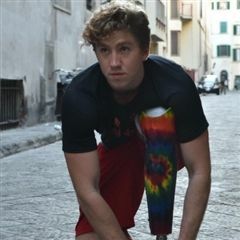 In his talk, Parnell talks about promoting the disability spirit in a positive way. "It's simple. Focus entirely on your capabilities, rather than on your disabilities." After nearly 20 years in New York, Nicole Wyskoarko '96 is back in Los Angeles. She recently celebrated her first anniversary as executive VP of Urban Operations at Interscope Geffen A&M (IGA). 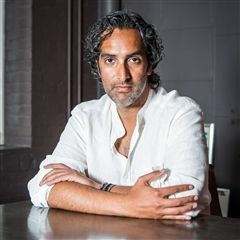 How Amar Lalvani ’92 is making Standard Hotels “a platform for creativity." Our Head of Schools is one very proud son, and for good reason. 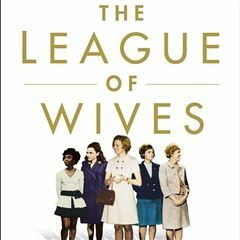 The extraordinary story of his mother, Sybil Stockdale, who founded The League of Wives to bring attention and action to the fate of American POWs during the Vietnam War, has finally been told in full. Admission into a selective four-year college or university today is difficult. The odds sometimes appear overwhelmingly slim. What does it take? Ask any member of the Class of 2019 and they will tell you that when things get tough, you have to get tougher! 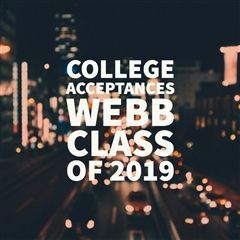 Once again, an impressive 100 percent of Webb seniors were admitted into selective four-year colleges—the vast majority to multiple colleges, and over 90 percent of the class to colleges ranked in the top 10 percent in the nation. 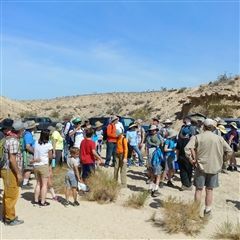 Alumni and friends are invited to join members of the Alf Museum's Board of Trustees and staff for a fun weekending searching for fossils in the Mud Hills near Barstow, Calif.